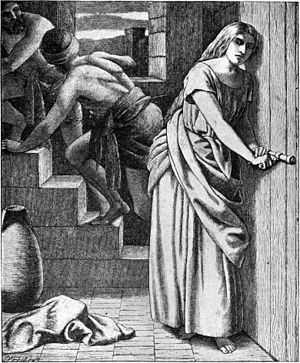 I love the story of Rahab, for several reasons. While Scripture tells us that Joshua sent the spies to scout things out before the Israelites came in and conquered Jericho, I think God had other motivations for sending them. I realize I am going out on a limb here, but I think God sent those two spies so that Rahab the prostitute and all of her family would be saved from the total destruction that was coming their way. She heard Him declare who He was through His mighty acts and she believed. She simply believed and it gave her the courage to ask for mercy. With those simple acts of faith a prostitute and her family were saved. And a prostitute married into the family of Judah and became part of the genealogy of the still coming King, Jesus. Many teachers and Bible scholars work hard to explain that either Rahab wasn’t really a prostitute or the Rahab listed in Jesus’ genealogy is not the same one as the prostitute in Joshua. The idea of a prostitute, a dirty, unholy woman being in the lineage of Christ seems incomprehensible to some. Why do we have to make things fit into our clean, nice, neat boxes marked “Christian” for us to believe they are God? Life is hard. People are messy. Relationships often don’t make sense. We are broken, some of us are just better at hiding it than others. We are all the liar, cheater, and prostitute who needs Jesus. Not only do we need Him, He wants us. He desires relationship with us. In fact, He’s died for it. Do you hear Love calling your name and declaring Himself for you? Announcing His coming for your heart, right this very minute? Love is coming, believe it!